The ability to retain auditory information in our working memory while simultaneously working on that information is vital for many problem-solving tasks. For example, if you are driving and stop for directions, you need to store the information and match the directions to street markings and landmarks. When you are in a meeting you need to remember what has been said and manipulate that information to make novel decisions. In Auditory Ace you will be presented with auditory information about playing cards. The information is presented one card at a time. Your task is to decide if the current card information matches the card information presented a specific number of steps back in the sequence. For example, in the first level you will decide if the current card information matches the card information presented just before it. 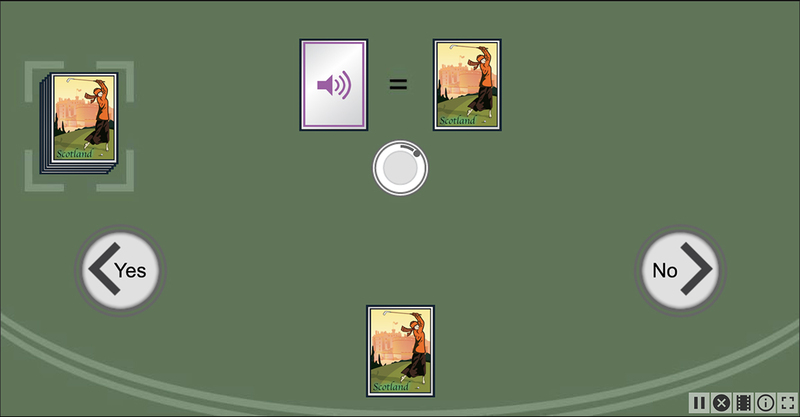 In later levels you will decide if the current card information matches the information presented further back in the sequence. Auditory Ace challenges your ability to retain, compare, and work with more auditory information. Your score is the percentage of comparisons you get right.